When it comes to the fast and accurate measurement of turned, ground and cylindrical components, VICIVISION has been there and got the T-shirt. As the leading supplier of optical, non-contact inspection machines and quality control systems across the UK and Ireland, there is no challenge that our shrewd engineering acumen cannot overcome. Across the full product range, high-spec models and their wide-ranging functionalities have been helping manufacturers of all sizes and across all sectors to significantly improve their production performance. Achieving smarter and more reliable processes, delivered with speed and efficiency regardless of the complexity of a part, means reduced rejection rates, minimal rework and therefore cash savings from day one. When businesses can guarantee a repeatable supply of quality products, first time and every time, the reputational impact is nothing but positive. With increased product throughput comes increased capacity, allowing manufacturers to take on more work with the confidence that they can meet demand. 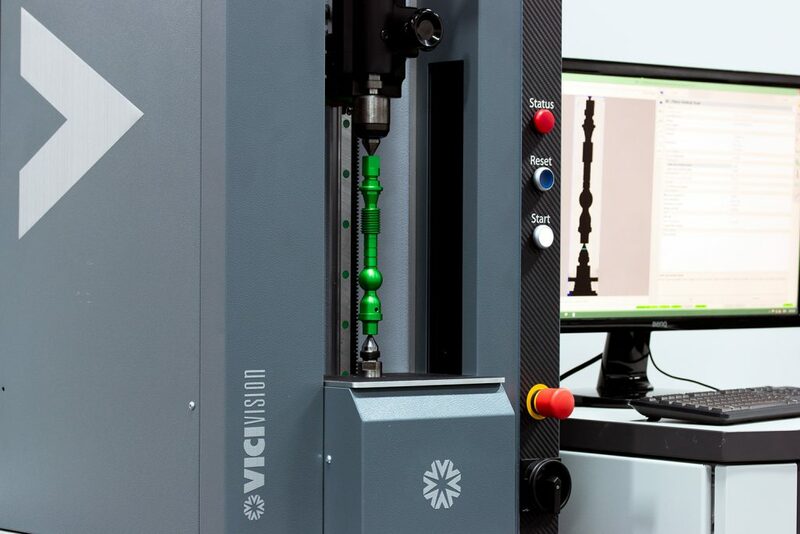 Camshafts – VICIVISION’S MTL range of optical measuring systems is designed to operate directly on the shop floor. Standard multi-point thermal compensation allows for precision inspection outside of the metrology lab, helping operators to keep production moving swiftly and efficiently. The wide-open measurement area and optics that retract between routines enable safe and easy loading, while intuitive software easily captures critical part features. Even inexperienced operators can measure radii, diameters, lengths, chamfers, roundness, coaxiality and runouts in one programme. The addition of VICIVISION camshaft inspection software means that, with one tool, it can provide basic radius validation, maximum lift, deviation from the theoretical law of motion, deviation from the theoretical velocity, deviation from the theoretical acceleration and basic profile runout. Dental implants and trauma screws – the VICIVISION MTL X5 and X10 have been specifically designed to measure micro-mechanical parts typically seen in biomedical technology, dental implantology and watch-making, giving micron precision in an all-in-one solution. The measurement routine is conducted on an enlarged, high-resolution image of the workpiece to obtain details of lengths, diameters, angles, radii, bevels and threads, with total accuracy and objectivity. Production trends can be monitored thanks to clearly output statistical reports. As the component programme is activated at the click of a button, no specific prior operator measurement knowledge is required and a conclusive data set is collected in just seconds. Turbines – VICIVISION’s Techno series offers immediate data capture and benchmark reliability to detect every last detail of parts like turbines, with or without a stem. Thanks to wide measuring fields, impressive load capacities, a temperature control system, high-resolution capabilities and intuitive software, parts can be inspected on the shop floor, with fast and efficient batch changing leading to greater productivity. There are multiple benefits of allowing operators more independence during inspection – these include making tool offset adjustments possible before parts become out of tolerance, as well as encouraging immediate preventative actions as indicated by measurement trend graphs. With a part rotation speed of up to three turns per second, Techno provides the ability to dynamically measure an impeller at a speed that was unthinkable just a few short years ago. Our customer-oriented approach means we are constantly seeking to develop products in a way that exceeds even the highest expectations, providing reliability in a world where components are ever smaller, tolerances are increasingly tighter and demand for quality is at an all-time high.